Meet Violet, Tigerlily, Hyacinth, Petunia, Junebug, and Cricket, six new Mouse Scouts who are trustworthy and strong, thrifty and brave . . . and destined to be friends to the end! Best friends Violet and Tigerlily can’t wait to start earning their merit badges. But their troop leader, Miss Poppy, is one strict rodent. And earning their first badge—planting a vegetable garden—is hard work. Will the troop drive unwanted pests from the garden and earn their Sow It and Grow It badge? And will they ever get Miss Poppy to smile? 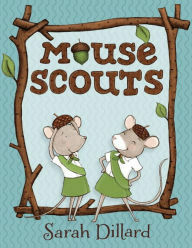 I found Mouse Scouts to be adorable and fun, brimming with cute black and white illustrations of the Mouse Scout's activities. The very Girl Scout Mouse Scouts brought me back to my years as a member of Girl Scouts, and working to earn those colorful badges. Further, I liked that the pages from the Mouse Scout handbook were interspersed throughout the book; especially when they gave useful tips for elementary aged gardeners. Definitely a series to pick up for fans of Ivy and Bean, or a child who likes animals and getting their hands dirty in the yard. Violet, Tigerlily, Hyacinth, Petunia, Junebug, and Cricket are back, with another rousing adventure to earn their next merit badge! 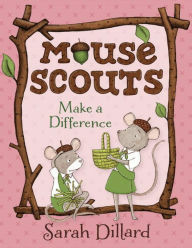 This time the Mouse Scouts are working to earn their Make a Difference badge; but how can six little mice make a big enough difference in their community to be noticed by Mouse Scouts Monthly? Once again, packed with adorable illustrations, and pages from the Mouse Scout Handbook which encourage young readers to try some of the Scouts activities, Mouse Scouts: Make a Difference is a cute story about believing in yourself, and the little acts of kindness that can brighten someone else's day.